It’s been an interesting week, and I’m inspired to write first thing in the morning. In the last couple of weeks, I’ve upgraded the memory on my small laptop, fixed an air conditioner problem, almost fixed the washing machine (that’s OK, the nice repair guy finished what I started), all with the help of YouTube. You can fix nearly any problem in your life with a YouTube video. I also got enough stars on my Starbucks card to have a gold card (long story, but it’s mine) and re-connected with an SGI-USA member who I used to know in New Orleans, but now happily lives in central California with her new partner. Facebook is also a great thing, long as you don’t put TOO much there. I’ve got a few more things to do, and I hope to shampoo the carpets this weekend, but life is buzzing along in different areas. We’ve had a good dousing rain this week, and the plants couldn’t be happier. (Is the drought over yet?) Heck, the weeds love it too, because I haven’t gotten out there to get rid of them. When the rain stops, I plan to get some weeding done, and maybe yank out the “houseplant-gone-wild” stuff out front. It’s about to grow into our living rooms. Neighbor K and I dug up most of that stuff a couple of years ago, and it was mostly gone, except for where we stopped. It’s growing now, under the stairs, where we quit digging. We’re expecting the second cool front next week, and if I can get around to it, I’ll do some fall gardening and weeding. The garden is about the same as last week, just waiting for stuff to grow more. I think it’s raining all over the world. . . .
Last night I went out foraging (shopping) and my beloved grocery store HEB has foot-high potted basil plants for $4 each. I didn’t buy one last night, but am considering it. I need to re-stock the pine nuts, but if I get one or two. . .would that give me one more pesto batch? The little basil stubs I have may not grow big enough to give me more, so, I’m thinking about it. You know I love my pesto. Before I went out, I went through the coupon stash I’ve been collecting, and it’s amazing that so many had expired. Need to keep up with that, but I managed to find a few I could use. I sat down to watch the very handsome and manly Mike Rowe do some Dirty Jobs while I cut them. One of those jobs was going to an animal sanctuary and handling a 5-month old “Ti-Liger,” a hybrid big cat with a milder temperament that would eventually become about 1,000 pounds. It was just a big kitten, no kidding, and probably weighed at least 65 pounds during this filming. The job was to walk this animal and wash its beautiful fur. No kidding. Mr. Rowe was a bit nervous with a carnivore with huge paws sporting very sharp retractable claws. Much as I love the felines, I do not want to deal with that cat’s litter box. I bought two of those plastic bottles of cat litter so I wouldn’t run out for a while. The 15-pound cat in here is enough for me. I also am trying out Sheba cat food for Jezebel–it’s a couple of cents cheaper per can, and I found several coupons for it. However, despite the beautiful kitty in the advertising that looks a lot like my deceased Catmandu, Sheba also uses responsibly sourced fish, and does not contain corn, wheat/grains or soy. I mistakenly bought a can of chicken and tuna last night, but she gobbled it up this morning. I think we’re changing cat foods around here. Wish I’d tried this with Catmandu and Kismet, but we just move forward, not backwards. I also clipped a coupon for Silk’s refrigerated coconut milk, which I bought one of to try. It’s fine. . .no soy, no lactose, all that. I like the shelf-stable stuff the best. A trip through Target, and then onto HEB, netted me a couple of things that my longtime friend The E-Man can get behind. I’ve known him since October 1988; he can tell you the date and time I met him; he’s one of the first SGI-USA members I met when I relocated to New Orleans from California. When I got married in 1996, we put him in a tuxedo to make him behave; it sort of worked. But until about 12 years ago, I didn’t know The E-Man was allergic to eggs. It’s OK if the eggs are IN something, like a muffin, but eating them as I do, hard-boiled, scrambled, etc., no. That means mayonnaise is out, too–especially the fresh stuff I whip up in a blender. 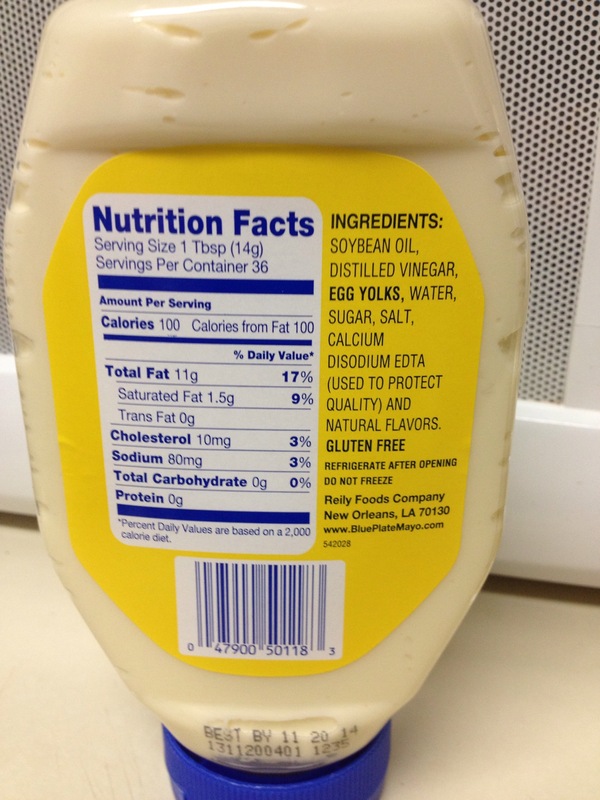 Last year, I told you about lab-grown beef and eggless mayonnaise, which The E-Man might like. Last night, I found some in Target. 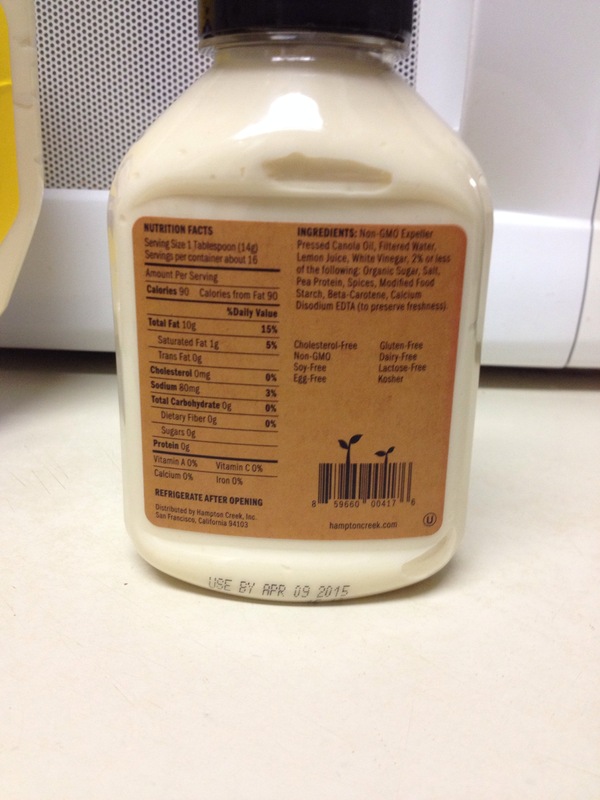 Called Just Mayo, an 8 ounce bottle costs $1.99 in SuperTarget. (I also got some Blue Plate Mayonnaise for $2.24 at HEB.) Since there aren’t any SuperTargets in his neck of the woods, a quick search shows that Dollar Tree and Whole Foods in his area carries it. Dollar Tree? Ok, whatever. DT also carries it here, but I don’t know where they are. Target is fine with me. The company, Hampton Creek, also makes cookies, but I didn’t see them in Target. There is also a larger jar of Just Mayo, but I didn’t look at the price on it. 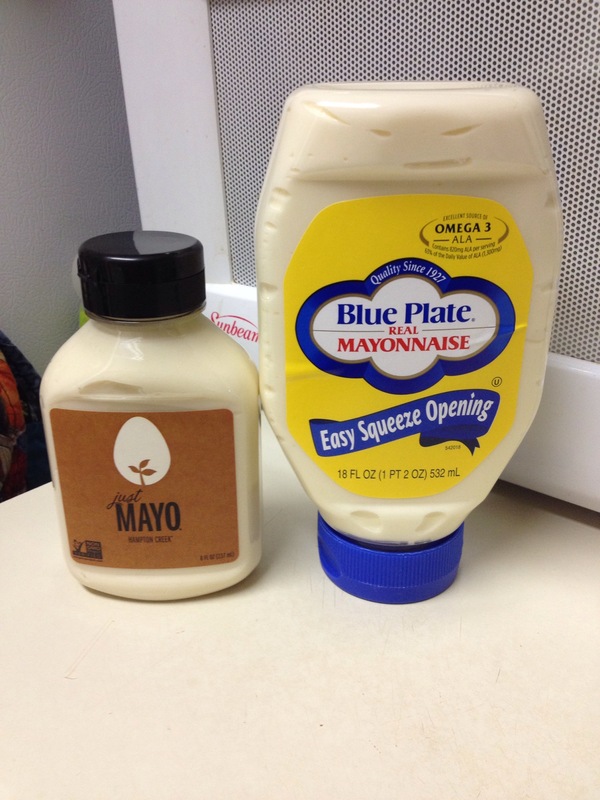 Mayo: one regular, one vegan. Why Blue Plate? I grew up with it, so to me, that’s what mayonnaise means. No, I do NOT like Miracle Whip. I don’t mess with Blue Plate too often, though. Yes, I know. . .but I don’t use it very often. But hey–it’s gluten free!! No eggs. Have at it, E-Man! Unusual ingredients, non-GMO is always good; pea protein is something I see occasionally in other foods, like Larabar’s Alt Bars. It’s how they keep from using soy in it. If you have someone who can’t have standard mayonnaise, this might be an alternative for you. You can read more at Hampton Creek’s website and decide for yourself. Much as I’m not a veeeeeegan, alternatives are usually a good thing. When Hurricane Ike hit in 2008, I ended up at his place. Irony–going TO New Orleans to evacuate for a hurricane. I was there nine days. The E-Man keeps his cool at all times. I can’t say I do that a lot. But I gave his wife as much of a break from cooking as I could. I did create a chicken salad for them that had no mayo, and was, I think, pretty darn good. I based it on a Giada de Laurentiis recipe, using a rotisserie chicken, and a vinaigrette kind of dressing, tossed in some sliced grapes, and it turned out well. I haven’t made it since, but I do have a printout in my notebook of recipes I’ve printed from the web. FREE COFFEE ALERT: McDonald’s is promoting their McCafe’ coffee by offering a free small coffee every day during breakfast hours from now until September 29th. I haven’t gotten over there yet, but be forewarned that McDonald’s has sugar and Equal (blue stuff.) They don’t have Sweet ‘N Low, so if you don’t want Equal, bring your own. McDonald’s coffee is actually pretty good, I just don’t go in there very often. If you’re over 60 or 65, I think it’s half price, but again, during the morning, small coffees are FREE! Check it out if you’re interested. When I first moved to Houston, I used to buy this for me and my ex-husband, although it used to be regular. I forgot how good it is, and had some just this morning. Why haven’t I bought this for so long? I think it was about $7, much less than the Starbucks coffee I thought about getting in Target. I’m not knocking Starbucks, of course, but I sure did miss this one. I think I’ll be having this more often, too. Is there a penalty for drinking it from a Starbucks coffee cup? Well, it sure was good. 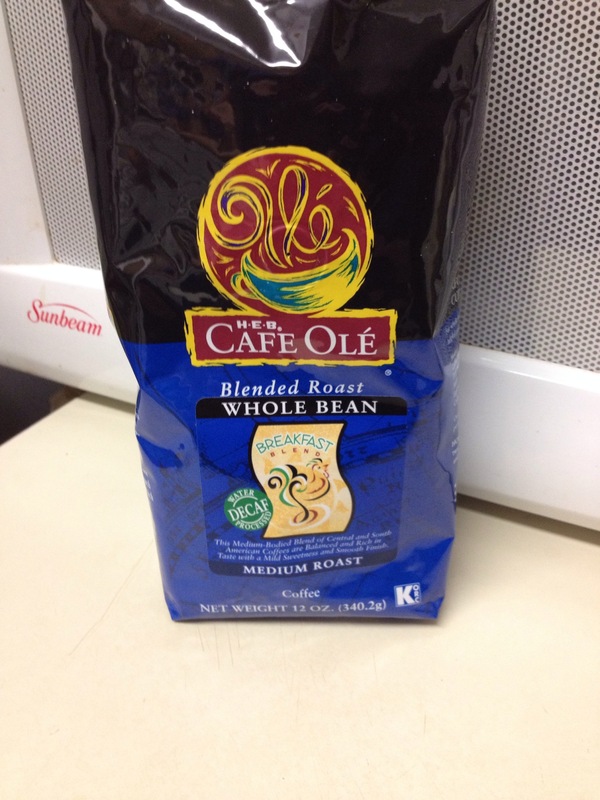 Don’t knock grocery store coffee. You might be surprised at what you find. If you really, REALLY enjoy coffee, you might want to check out Nick Usborne’s website, Coffee Detective. Nick loves coffee, and discusses different types of coffee, coffee makers, and all things coffee. You can read about my favorite method, the French Press, at this link; he also has videos on the subject. Would Nick like this coffee? Heck, I dunno. What you like might not be what I like, and what you and I like might not be what Nick likes–but isn’t that what makes life interesting? Think I need another cup, y’all. Fall fruits are starting to come out, and I got a couple of small Bartlett pears; they’re ripening on my altar. But in about a month, you KNOW what’s coming. Pomegranates!!! I LIVE for pomegranate season. I don’t care about the mess they make, or the little red arils that I find on the floor sometimes when I vacuum. I LOOOOVE pomegranates. Off I go, on with my day. Make it a good one, everyone!